Seven has conceded the end for Million Dollar Minute, to be replaced by The Chase with Andrew O’Keefe. It will also hold off a promised second season of House Rules in 2015 after a glut of renovation shows this year. “We’ve got a (House Rules) series there but I don’t think the genre matching that has occurred this year has helped anyone,” programmer Angus Ross tells News Corp. It will now be held until 2016. Until now Seven has dodged TV Tonight‘s questions on the future of Million Dollar Minute, but it now confirms the show will be discontinued. “I always want shows to win their timeslot … and it hasn’t done that unfortunately (so) we need to rectify that,” he says. 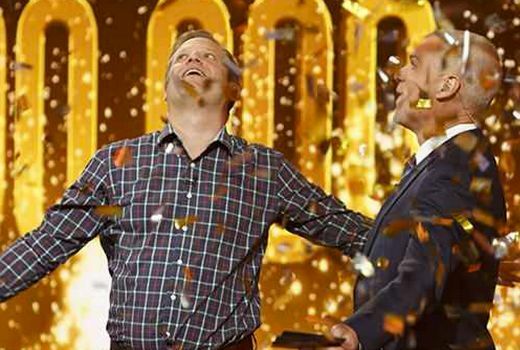 But networks have traditionally featured half hour game shows in the 5 – 6 timeslot, and it will be fascinating to see if Seven can get the jump on Nine’s Hot Seat in the game show wars. “We are about to unleash hell in the final quarter,” he said. Yes Simon Reeve is from Perth!! Yes Simon Reeve is from Perth!! If he told us Once he told us 100 times, get over it Son. They should have sacked Simon Reeve,but anyhow bring back wheel of fortune!! So will Nine double up Hot Seat at 5pm to fight off The Chase? Probably the right decision to hold off House Rules, though with it already in the can I’d hope they’d play it out before Easter and delay MKR a few weeks. I guess they can hold off renovating the Secret Rooms until just before the live finale takes place. Wish they would return Wheel Of Fortune! Simon expected to return to Weekend Sunrise now permanently? I have enjoyed MDM and will miss it but hope that The Chase does well it should be good having a different game show for a change, also channel 7 have to be commended for holding off on more renovations shows, if they stick to their word, think that people are so over them now and I don’t know if a third one for channel 9 this year will fare well, they obviously don’t have any back up programmes that they can show it would have to be more repeats and more repeats which they seem to have an abundance of. I found the News Ltd story actually offensive. Angus Ross needs a reality check if he is promising to “unleash hell” on Nine and Ten. Its TV nob! not a war; except a war of egos. Talk about a total discontent with the audience and the media landscape – could that be the reason why his shows are not resonating with people and they are finding their entertainment else where? I’d take as a bit of a dig at the attack that’s occurred from the other networks, particularly 9. Their very calculated moves to kill off 7s flagship shows by saturating the market, and blatantly ripping off ideas is so completely obvious… this is merely the fight back. The Chase will not last a month. Ok shall I mention the “elephant” in the room….. How the hell is Channel 7 going to hold House Rules over to next year, from reports it appears it has finished and they would need to air the Winner announced Live….. Pity help the poor last two couples having to wait till middle of next year to see if they have won….. Those couples must be spewing…. Indeed. What to do if any of the on-screen talent suffer a mishap over the next 6 months prior to the screening. Not to mention the fact that all the contestants houses have been fully completed and even the Winners’ neighbours will know they got into the finals because their house and front yards are renovated. Thanks. In the back of my mind Price was hovering, but I thought it was a different timeslot for 1 hr. I have corrected. I think The Chase looks good – will certainly give it a go! I wonder if 7 news will be relaunched at the same time? I think 9 use to have 1 hour versions of The Price is Right from 5 to 6 – not sure how they performed. Has anyone else noticed that 9 is now using the “coming in September” tag? They have spent years riding on 7’s coat tails and have once again done it again with 7’s September re-launch. Seriously, does someone at 9 actually get paid for this? Nine have new shows that are coming in September. What would you like them to use as promotion then? I know, “We’ve got Shows that will make you laugh out loud”……. Peejaybee: Does it really matter. Not sure if a 60 minute game show will be a winner. That’s a long time to sit and watch tv at such a busy time in most households. Not a fan at all of AOK and his style of humour. I will stick to Ten News. I have nothing against AOK…. However if they are going with the theme of a revamp…. Why would you use the same host that you use for everything? Surely with 23 million people in this country there has to be other alternatives? no surprises there with the axing of Million Dollar Minute. Would be interesting to see how our version of The Chase will rate. I hope it does well. David, there were a few episodes of Deal or no Deal which were one hour in the 5-6 pm slot. There wasn’t that many episodes of this length and that time slot. If you are asking “When was this?” , I believe that it was shown during Seven’s last days of having MASH repeats at 5:00 pm. Not for me sorry. I just don’t think the format works as people want to see big money wimners & The Chase is geared towards the Brains Trust, not the contestants. I wlso think they have made a mistake importing the Governess. She is far to pompous & who wants to watch an Aussie get put down every day by a Pom. I just don’t get Andrew OKeefe’s cringeworthy effort at humour. I will try and watch because I love The Chase UK. Thanks for the heads up David. I am going to miss Million Dollar Minute as I thought Simon Reeve made a great quiz-master. Lately though the contestants who have made it to the minute have either struggled with or walked away with the $20,000. It would have been awesome if the show could have had a female millionaire.